The chance to become the next multimillionaire will happen tonight around 11 pm. According to an article written by Kaitlynn Riely of The Pittsburgh Press. Two people were interviewed about the Powerball drawing and both of them bought a ticket. At $2 a ticket, why not buy one to attempt to win that much money? Riely points out there are only a one in 175 million of a chance of actually winning this amount of money. The reason this amount of money has grown to what it is is because since October 6, no one has won in the 15 times they have held drawings. One of the interviewees won a lottery game in 1979 so he hopes that will bring him luck with tonight’s contest. Paul Woods says “You gotta be optimistic.” If Mr. Woods won the lottery he would donate the money to charity. He would also open a place for homeless veterans to stay and then use the rest to take care of his children and grandchildren. An article like this is newsworthy because for one, it’s happening right now. This is a big Powerball and it’s got a lot of peoples’ attentions. An amount of money this big doesn’t happen often so that’s another reason it has many people trying to win. Another reason this story is newsworthy is because this news doesn’t happen very often. It’s not odd but it’s rare. One thing I may have done differently with this story or added to it was talk to a convenient store worker or another place they are selling the tickets. I would be interested as a reader to hear from a worker what people’s reactions are to this amount of money. In Lake City, Iowa, a fatal house fire claimed four people’s lives. This incident took place early Tuesday morning. The four people who lost their lives were 22-year-old Tyra Pierson, her 11-month-old son Xavier, Madison Pierson, 8, and Wyatt Pierson, 3. Police, Dana Cook was on patrol when he noticed smoke coming from the south end of town. When Officer Cook approached the house it was too hot and there was too much smoke inside the house to make an attempt to go inside. When the fire department showed up it took them two hours to get the fire calmed down enough for the firefighters to go in. When they got in, the firefighters found all four of the resident dead. The cause of the fire is unknown but officials are still investigating. This type of news is local news. I find this newsworthy for me because I know where the town is. I don’t know the people but it still is of interest because I’m from that area. Another reason I find this newsworthy is because you hear about house fires, but you don’t hear about people not being able to get out of the house and survive them. Unfortunately, this is sad news but this is the type of stories that grab peoples’ attention because things like this don’t happen every day. With most articles in the news today being about the results of the elections last night, there is a twist on a few new laws that were voted in and declined in states such as Colorado, Washington, Massachusetts, and California. A big topic today is how making marijuana legal in Colorado and Washington is really going to work with the drug being illegal in the other 48 states. In Colorado, the vote passed at 54 percent. Stipulations come with the new law. A user has to be 21 and can’t buy or posses over one ounce of the drug. A person cannot grow more than six marijuana plants and if they are growing them, they have to keep the plants in an enclosed and locked space. In Washington, the law is similar to Colorado. The person has to be 21 and the state added a threshold for driving under the influence of marijuana. The vote to allow the drug in Washington passed with a 55 percent. In other news relating to marijuana, Massachusetts passed a vote to legalize the drug for medical purposes. Other new laws that were passed or denied dealt with the death penalty, the three-strikes sentencing law, physician-assisted suicide, and condom use on adult film sets. The death penalty was denied in California with a 53 percent of voters rejecting it. Also in California, voters approved the three-strikes law benefiting people who commit a third felony and it isn’t a violent or serious act. An act to pass a physician-assisted suicide was tried in Massachusetts but was denied by voters. The last law voters voted on last night, discussed in this article, which passed was using condoms in adult film sets. California voters voted to have that law enforced. I think this article is very newsworthy with how timely it is. Although most of the news is filled with these articles today, I picked this one because it brought up interesting laws that voters voted on that passed and didn’t pass. Most of the articles readers are reading today are about President Obama and Mitt Romney. I think one of the biggest things the legal system and government will have to deal with is legalizing marijuana in two states and not having it legal in the other 48. Having this article discuss that, I think it very good and draws readers in because they want to know what is going to happen with that whole situation. Overall, this article just has a lot of good information and the whole article is very informative for readers. I picked this article because first off, I know Alex Watters and this story is going to be familiar with not only a lot of people on campus but around the surrounding area. Roger Martin traveled to Morningside a few weeks ago to spend an afternoon in Alex’s shoes. Alex Watters is a 2009 graduate of Morningside. He came to Morningside in 2004 on a golfing scholarship. This article talks about the journey Alex has taken to get where he is today. When he arrived on campus in 2004 he went back to Okoboji with a friend one weekend. Alex and another person decided to go out for a late night swim. After the two got out to the dock, a gust of wind came up and blew Alex’s hat off. He decided to dive in to go get it. The only problem was he dove into 18 inches of water. He instantly went limp and laid there for a few minutes before he went limp. The rest of the article talks about the obstacles Alex faced while at Morningside and also what he faces today. He has made a lot of strides since he graduated Morningside and one thing is his confidence. If you talk to Alex today, he was one of the most confident people you will ever meet. I think the way Martin wrote this article was awesome. While reading it, I felt like I was in the author’s place as he was going through campus in the wheelchair. Even the little details he added in very well. For someone who isn’t from around this area of the country, this article probably isn’t as neat. For people who know Alex, to have an article about someone you know in The New York Time, that’s awesome! That’s the reason I read the article. I saw it was about him so I read it just because of that. If you are someone who doesn’t know Alex Watters, you may read the article because of the title. It’s intriguing on its own. The story as a whole is very motivational and uplifting so I think that’s another reason people would read it. You don’t hear about too many people that are quadriplegics so it’s a different type of story that may interest people in wanting to read about his story. In the article from USA Today, Tagg Romney, Mitt Romney’s son apologized for the comments he made after the last Presidential debate. After the debate was over Tagg Romney spoke with Obama apologizing about the comments he had made earlier about the president. Jokingly the article ends by Josh Romney, Tagg’s younger brother saying that the president has nothing to worry about because Josh has taken punches from his older brother. This isn’t too big of a story and only has one main point to it but just the title alone truck me to read it. After reading the story this is news to the whole country because it deals with two of the biggest public figures right now that are in the news. Another reason this is news is because you don’t normally hear one of the presidential candidate’s sons say that he would like to get up from his chair and punch the president in the face. USA Today did a good job of presenting the news but also presenting the news of how Tagg apologized. 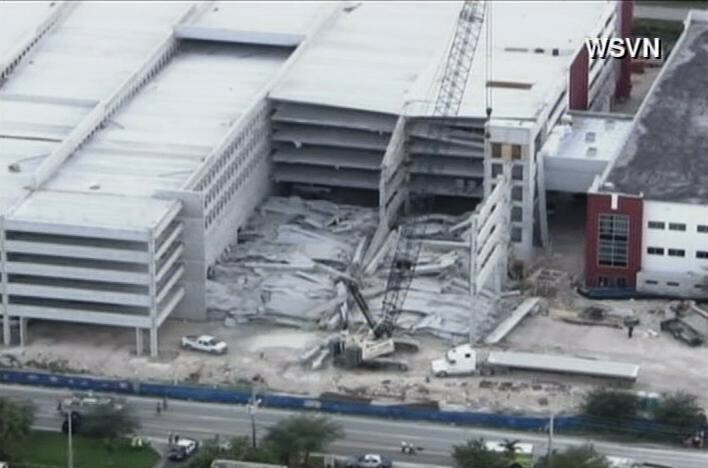 The article, “1 dead, others trapped in Miami parking garage collapse,” written by Suzette Laboy, is about a parking garage that collapsed Wednesday morning while under construction, killing one person and injuring many others. In this release of the story, it is apparent no one is sure what caused the garage to collapse. Emergency response and construction workers rushed to the scene immediately as it happened. Two of the trapped workers used their cell phones to talk to the rescue teams to be found and helped. The rest of the story went on to describe what the construction site looked like and what the construction project was for. This is news worthy and news in general because it’s something odd that doesn’t happen very often. Of course, this type of news doesn’t really affect people like us in the Midwest who have no contact with people in Miami. If the person who died would have been a family member or you knew someone who worked on that construction site, this news story could be more interesting to you. I also think the way this story is written is really good. The author does not only do a good job of describing what happened but visually I could see it too. Most news stories I read, it’s basically just telling you what happened. A news story like this, I think having a visual helps the story come to life a little more. President Obama and Mitt Romney get ready to face off in their first debate tonight, October 3rd, in Denver, Colorado at the University of Denver. The candidates also have two other debates scheduled until November 6th. This article talks about how the president and Romney prepared for this debate. Romney faced 19 debates during primaries earlier in the year where as Obama hasn’t had a face-to-face debate with anyone since he was running against Arizona Sen. John McCain in 2008. When practicing for the debate Obama brought in Massachusetts Senator John Kerry and Romney chose Ohio Senator Rob Portman to represent the president. As this story made it clear, according to opinion polls, President Obama has an advantage over the nation and the majority of the swing states where the outcome between the candidates will likely be decided. With voting day less than five weeks away now, these debates could possibly make or break the decision for whom to choose as president for some people. I believe this article is news related because the presidential elections is something that news teams cover every day and it’s a topic that is very interesting to people. Who the better candidate is for president is a debatable issue between voters so sometimes news stories can help them with arguments they make towards one another. With this article though, I find that as you read it, it seems as if the debate has already happened. Since this was posted around 4:15 pm on Wednesday, October 3rd, and the debate doesn’t start until 7:30 pm tonight, it seems as if boston.com news missed something. It appears as if they either accidently published this story already or wrote the story in past tense which makes it seems as if it’s already happened. UPDATE: I checked back on this article around 8 pm and the news story had been updated to a story that seems to preview the debate rather than talk as if it already happened, which was the way the story was earlier this afternoon. 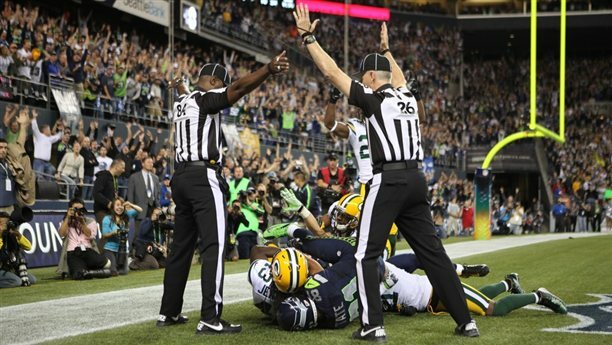 A call who some say cost the Green Bay Packers a tally in the win column Monday night against the Seattle Seahawks is a hot topic with sports sites, NFL commentators and specialists, and football fans everywhere this week. Now three weeks into the season with replacement referees, the fans are beginning to see a difference. The last call of the Packers Seahawks game came down to a Hail Mary pass thrown by Seahawk’s quarterback Russell Wilson. The back of the end zone was filled as both teams went up in the air to fight for the ball. Packers safety M.D. Jennings and Seahawk Golden Tate came down simultaneously with the ball. As Jennings landed on top and the two wrestled to the ground, one of the end zone referees signaled a touch back while the other signaled a touchdown. 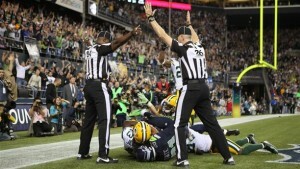 From that moment on, people have been raising a lot of heck about these replacement referees. Spectators also didn’t forget about the pass interference call the refs didn’t call during all that commotion or the few questionable flags before that as well. As this article mentions, headlines from different sports websites read different things such as, “DISGRACE!” “Nightmare scenario,” “The Straw That Broke the NFL’s Back,” and many more. Twitter users also took to their accounts to express their anger towards the NFL and the outcome of the game. As the whole deal with the replacement referees in the NFL has been building this is news for anyone who likes football or maybe even is just a football fan. Of course, if a reader doesn’t care about football or the recent replacement referees, then any of the football related news article is not news for them. For me, I would consider this news. For someone who doesn’t care about football at all, this would not be news for them at all. After the teachers’ strike in Chicago ended today, 350,000 kids could return to school after not being able to go for a week. In this article, the author talks about how it’s still not clear there is solution to the problems that initiated the strike. Although the strike is over, the union and city leaders have not exactly come to an agreement on what the teachers were on strike for. The mayor of Chicago was able to make school days longer for teachers. With the lengthening of school days, teachers still gave up other things as well. They gave up their accumulated sick days, agreed to join a wellness program to keep their health care costs down, gave up their request for a 30% raise over four years. The teachers were forced to accept that their students’ test scores were going to be included in their evaluations. This strike was a way for the teachers to show the people in Chicago that they still have a way of making a difference. Some people think ultimately this was a loss for the students. They lost out of school for over a week and still have teachers that are truly happy with the decisions being made. The strike coming to an end is news for anyone following the story or anyone in the Chicago area affected the by the strike. I also think its news for the general audiences because this is a rare type of news. You don’t hear about schoolteachers going on strike to often anymore. The only thing I think the author could have added to make this article a little more understanding for the reader is to include a short synopsis of what the original reasons for the teachers going on strike.